Printable Black & White PDF Printable Color PDF More Paper Dolls & ClothesI thought it would be fun to end the week with a fancy paper doll gown since I posted my paper doll tuxedo last week. So, here’s an evening gown for the B pose ladies based on this evening gown from Marchesa’s Pre-Fall 2016 collection. I loved the shape of the original gown. In case you are wondering, the low cut neckline of the gown is possible because of the skimpy underwear of the B pose ladies. Without those handy leaves, the neckline on this dress wouldn’t be possible. That’s why I tend to draw such skimpy undergarments for my paper dolls. I don’t want to be limited in my neckline options. Today’s gown isn’t a perfect reproduction of the Marchesa Pre-Fall 2016 evening gown. To start with, my gown isn’t made from lace and the skirts are a lot fuller. I wanted this to feel like a confection. The sort of light weight floating thing that would move beautifully when you walked if, you know, paper dolls could walk. Marchesa is one of my favorite designers. I adore the elegant evening wear the line produces even though I don’t think I’m skilled enough to draw most of it. The highly detailed textiles they use are hard to render in ink. I think perhaps I just need more practice. 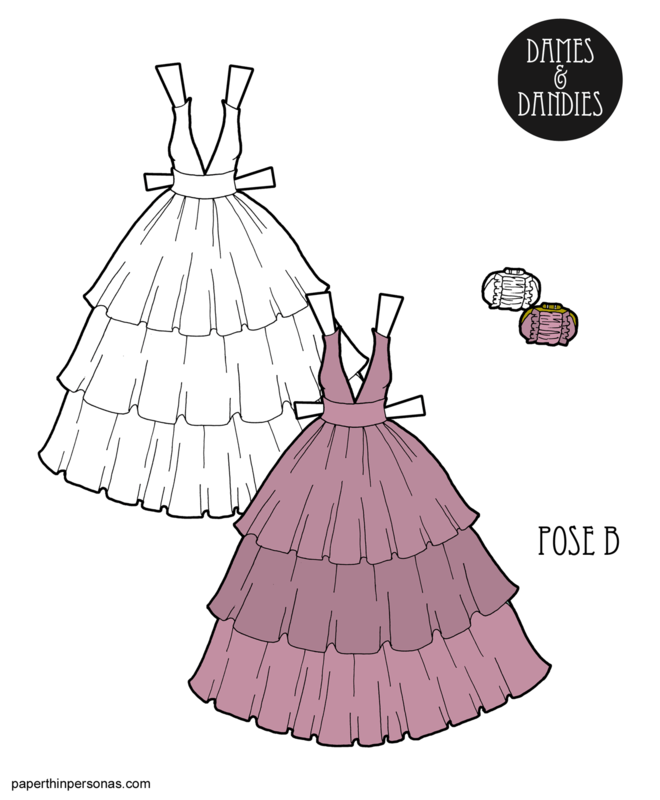 Secretly, I also like drawing evening gowns, because they tend to be complete unto themselves. I don’t have to think about tops and bottoms. I can just draw the gown and maybe a matching bag. They feel like less work than separates and, unlike cocktail dresses, I don’t feel a strange need to always draw two. One evening gown will do. So, I guess you could say I also look at evening gowns as a lazy option. I did draw a version of this dress during my #100dressesproject on Instagram. It was dress 41. I also shared the sketchbook page on Instagram back in July. Follow me there if you want more sketchbook pages or join Patreon if you want to help keep the blog on the internet and see behind the scenes stuff and get a totally different color scheme for today’s down. Need a clothing for today’s paper doll? All the B Pose Dolls & Clothing.